Background – Most organizations do not fully understand, or leverage, the key linkages between customer experience and employee experience/behavior. Enterprises typically focus on employee satisfaction or engagement, in the belief that high levels in either area will directly drive customer loyalty. Our research and consulting experience has shown that employee satisfaction and engagement have rather incidental connection to customer behavior. Employees, though, are critical stakeholders in the delivery of experience value. 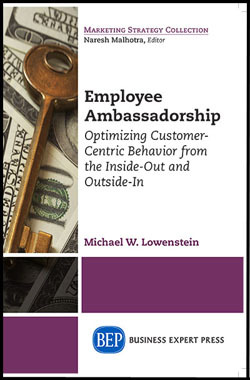 So, it is vital for companies to learn where they are in creating enterprise-wide employee ambassadorship (commitment to the organization, the product/service value proposition, and the customers) and stakeholder-centricity. Objective – This self assessment has been designed to help identify how, and how effectively, enterprise culture helps shape employee behavior and the delivery of customer value, with employee ambassadorship as an optimal state. The questions address such key areas as organizational readiness, employee life cycle, and leadership. Thank you for undertaking the Employee Ambassadorship Self-Assessment. Please fill out this form and one of our representatives will be in touch with you as soon as possible. 1. Recognize that employees’ behavior, like customers, has both emotional and rational underpinnings. 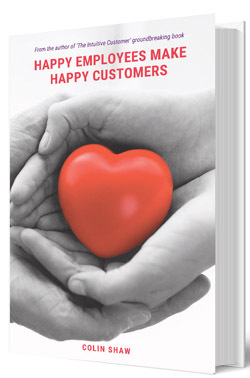 To what extent has your organization accepted that employee emotional state and experience influences not only their behavior but the behavior of customers? To what extent is the linkage between employee experience and customer behavior considered important in your organization? To what extent are specific emotions known that create and destroy value for employees and the employee experience? To what extent are staffing designs (hiring, training, reward/recognition, advancement opportunities, etc.) that evoke specific emotions, memories and actions on behalf of the company and customers, embedded into the employee experience? To what extent does the organization understand that there are differences between what employees say they want (their expressed priorities), what they actually mean, and what they do (decision-making) on the job? To what extent does the organization understand the drivers, and consequences, of employee positivism and advocacy? To what extent does the organization understand the drivers, and consequences, of employee negativism and discontent? To what extent does the organization have specific methods in place to address and repair/counteract employee negativism and discontent (once uncovered)? To what extent do employees in your organization have flexibility, i.e. are enabled and empowered, to act in situations involving other employees and/or customers? 3. Consider stakeholder-centric cultural effects on employee behavior. To what extent can the cultural DNA of your organization be described as ‘people-first’ and humanistic, stakeholder-centric and customer-centric? To what extent does the culture of your organization represent ‘conscious capitalism’, where employees are value-driven and values-driven, and they are actively included, and participate, in the direction of the company? To what extent does the culture of your organization support employees to consistently and positively “live’, the value promises of the company’s products/services? To what extent does the organization believe that it is more beneficial to the employee experience to move beyond their engagement to focus on the customer? To what extent does the organization measure employee ambassadorship, i.e. commitment to the company, its products and services, and its customers? 5. Consider that employees, like customers, have a defined life cycle. To what extent does the organization understand what originally drew employees to the company? To what extent does the organization understand what keeps employees at the company? To what extent does the organization understand what employees see as their day-to-day role, especially vis-à-vis customers, and how involved they are in it? To what extent does the organization understand what puts employees at risk for remaining with the company? 6. Consider the dual roles of organizational readiness and leadership in shaping employee ambassadorship behavior. To what extent does company leadership direct HR to shape and support employee ambassadorial behavior? To what extent do company leaders visibly support the concepts of having a customer-centric and stakeholder-centric culture?